Museum-lovers will get to explore Australian National Maritime Museum and White Rabbit Gallery. 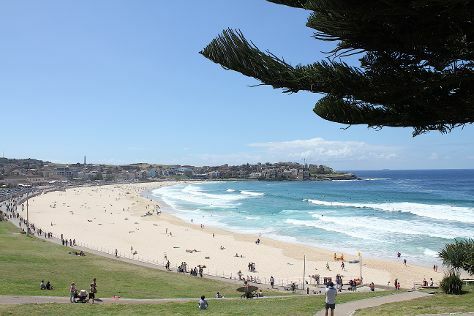 Bring the kids along to Bondi Beach and Harbord Beach. Explore the numerous day-trip ideas around Sydney: Leura (Everglades Historic House and Gardens & Fortress Rock), Katoomba (Katoomba Vintage Emporium, Blue Mountains Cultural Centre, & more), Norman Lindsay Gallery & Museum (in Faulconbridge) and The National Pass (in Blue Mountains National Park). And it doesn't end there: appreciate the extensive heritage of The Rocks, tour the pleasant surroundings at Bondi to Coogee Beach Coastal Walk, admire the natural beauty at Royal Botanic Gardens, and wander the streets of Darling Harbour. For ratings, maps, more things to do, and more tourist information, you can read our Sydney holiday planner. If you are flying in from Slovenia, the closest major airport is Sydney Kingsford Smith International Airport. In October, daytime highs in Sydney are 28°C, while nighttime lows are 17°C.